IHRC is demanding that Mua’llim Ibrahim el-Zakzaky and Mallima Zeenah get immediate access to doctors of their choosing. The call comes (see: press release) as concerns mount over the health of Sheikh Ibrahim el-Zakzaky after more than nine months in custody without charge along with his wife Zeenah. Both suffered gunshot wounds after a savage military assault against the Islamic Movement of Nigeria (IMN) last December. Sheikh Zakzaky has already lost the use of an arm and one of his eyes and there is a real risk he could lose his sight completely if he doesn’t receive the necessary medical treatment. Despite repeated requests by the Sheikh’s legal team, Nigeria’s domestic intelligence agency (DSS) which is holding the sheikh, has refused to let him have access to doctors. 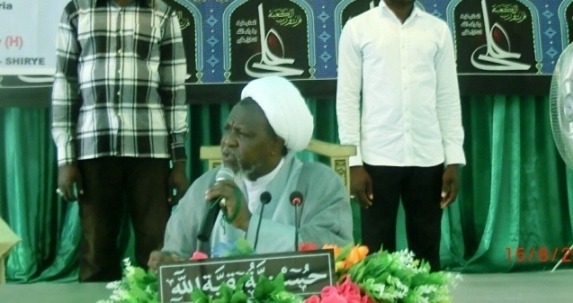 IMN members report the condition of the pair as ‘dire’. IHRC continues to call for the immediate and unconditional release of the pair and all those held since the 12 – 14 December attacks by the army on the IMN. Please call and encourage people to call the Nigerian Embassy in your country and register your disgust at the situation (telephone numbers here). Please email and encourage others to email the Nigerian embassy in your country and / or the Minister of Foreign Affairs in Nigeria (directory of embassies / high commissions here; address of Minister of Foreign Affairs here) demanding that the couple receive immediate medical assistance and that they are released immediately and unconditionally. Please email the Commonwealth Secretariat (email info@commonwealth.int) and the African Union (email form here), demanding they intercede on the couple’s behalf. I am writing to express my deep concern about the continued detention of Mu’allim Ibrahim el-Zakzaky, Mallima Zeenah and many hundreds more members of the Islamic Movement of Nigeria. In particular I am deeply distressed to hear that Sheikh Zakzaky and Mallima Zeenah are being held by the DSS and are both in desperate need of medical attention. I demand that both are given immediate access to doctors of their choosing and that they are both released without condition. Their detention and ill-treatment is a stain on the reputation of Nigeria that cannot easily be forgotten. I am writing to express my deep concern about the continued detention of Mu’allim Ibrahim el-Zakzaky, Mallima Zeenah and many hundreds more members of the Islamic Movement of Nigeria by the Nigerian authorities. In particular I am deeply distressed to hear that Sheikh Zakzaky and Mallima Zeenah are being held by the DSS and are both in desperate need of medical attention. Zakzaky has lost an eye after the army attacked him in the assault on the IMN last December, and is likely to loose sight in his other eye if he does not receive medical attention quickly. Mallima Zeenah still has a bullet in her body. I urge you to demand that the Nigerian authorities that give both immediate access to doctors of their choosing and that they are both released without condition. Your urgent action in this matter is highly appreciated. Please help IHRC by making a donation.